Enhanced CT image shows a lobular mass in the left parotid gland. The circumscribed borders and location are highly suggestive of pleomorphic adenoma, which was confirmed with fine-needle aspiration. 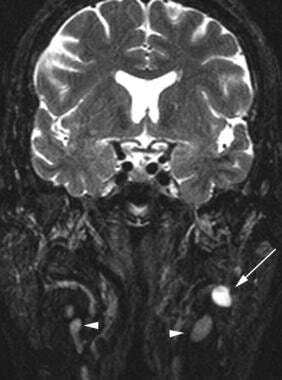 Coronal fat-saturated T2-weighted MRI demonstrates a hyperintense mass (pleomorphic adenoma) involving the deep lobe of the left parotid gland (arrow). The tumor has higher signal intensity than that of the visualized lymph nodes (arrowheads). This finding can help in distinguishing pleomorphic adenomas from intraparotid lymph nodes. MRI has the advantages of multiplanar imaging, and MRI results may suggest the tissue type on the basis of signal intensity characteristics. 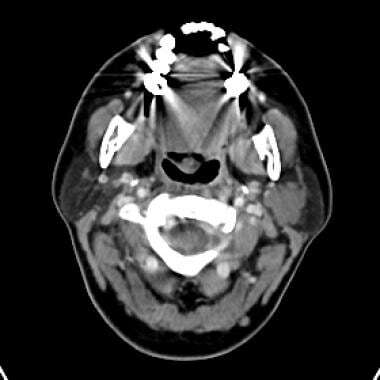 CT is often the first study ordered in patients with neck masses, and scans can show the mass and the retromandibular vein. Newer multisection CT scanners offer multiplanar capabilities rivaling that of MRI. Disadvantages of CT include radiation exposure, the use of iodinated contrast material, and tissue distinction poorer than that of other studies. CT may also be problematic in cases of benign pleomorphic adenomas when the outer margin of the tumor appears indistinct and suggests malignant invasion of the surrounding tissue. MRIs show the well-defined outer borders in these instances. In many cases, however, CT may be the only study needed to guide the surgeon. Sialography has been used in the past to diagnose parotid tumors, but it has been abandoned with the advent of CT and MRI. Pleomorphic adenomas appear as smoothly marginated masses that displace the parotid tissue and ducts. Many parotid tumors and lymph nodes can have a similar appearance. 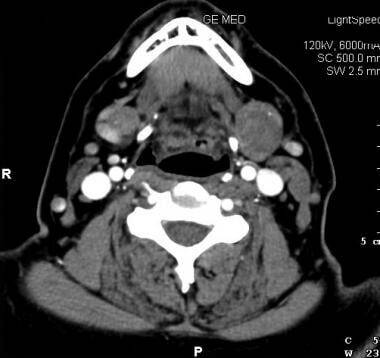 Axial contrast-enhanced CT scan demonstrates a poorly enhancing mass (pleomorphic adenoma) involving the left submandibular gland. The mass is smoothly marginated and causes the gland to expand. Image courtesy of Dr Doug Phillips, Director of Neuroradiology, University of Virginia. Tumor enhancement is variable and can result in a missed diagnosis if delayed images are not acquired. Pleomorphic adenomas are poorly enhancing in the early phase of contrast enhancement, though the amount of enhancement increases over time. Delayed images obtained at 5-10 minutes are often useful. Lev et al described increased degree and homogeneity of tumor enhancement over time. Although the average delay was 24 minutes, in practice, a 5- to 10-minute delay is almost as effective. When pleomorphic adenomas become large, they may develop a heterogeneous appearance with areas of necrosis, hemorrhage, cysts, and calcification. Large tumors commonly have a lobulated contour, which strongly suggests the diagnosis. Although certain CT features (eg, lobulation, homogeneity, delayed contrast enhancement) can suggest the diagnosis of pleomorphic adenoma, these findings are not specific to the tumor. In addition, CT results may falsely suggest invasion of the surrounding tissue; in these cases, MRI should be performed to ensure that a diagnosis of malignancy is not incorrectly made. MRIs can demonstrate a well-defined capsule, even when the border appears irregular on CT scans. 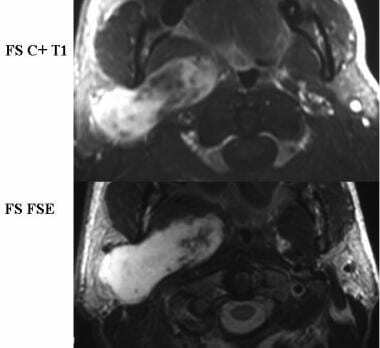 Contrast-enhanced T1- and T2-weighted MRIs in a patient with carcinoma ex pleomorphic adenoma. A large mass with a heterogeneous medial portion involves primarily the deep lobe of the parotid gland. The ill-defined anteromedial border, heterogeneous signal intensity, and enhancement, as well as the size of the tumor, all suggest the possibility of carcinomatous transformation. Image courtesy of Dr Linda Gray, Professor of Neuroradiology, Duke University. A well-defined parotid mass with increased signal intensity on proton density- and T2-weighted images is highly suggestive of the diagnosis. In fact, the increased signal intensity on T2-weighted images is so prevalent that any parotid mass with this finding should be viewed with suspicion, as this often indicates a carcinoma ex pleomorphic adenoma. When it becomes large, the tumor may lose its homogeneous appearance on MRI, as with CT. It may have areas of fibrosis, necrosis, and hemorrhage. Inhomogeneous signal intensity should be apparent in these cases. Lobulation is commonly visualized and is, in itself, also suggestive of the diagnosis. After gadolinium enhancement, the tumors are homogeneously enhancing unless they are large. Unlike CT, MRI has no role in delayed imaging. Gadolinium-based contrast agents have been linked to the development of nephrogenic systemic fibrosis (NSF) or nephrogenic fibrosing dermopathy (NFD). The disease has occurred in patients with moderate to end-stage renal disease after being given a gadolinium-based contrast agent to enhance MRI or MRA scans. NSF/NFD is a debilitating and sometimes fatal disease. Characteristics include red or dark patches on the skin; burning, itching, swelling, hardening, and tightening of the skin; yellow spots on the whites of the eyes; joint stiffness with trouble moving or straightening the arms, hands, legs, or feet; pain deep in the hip bones or ribs; and muscle weakness. The diagnosis of pleomorphic adenoma can be at least strongly suggested in most cases. Special attention should be paid to the signal intensity of the tumor and to any possible invasion into adjacent soft tissues. Although sonographic findings can suggest the diagnosis of pleomorphic adenoma in many small tumors, CT or MRI is needed to fully evaluate large tumors. Even in patients in whom the diagnosis is made by means of sonography and biopsy, CT or MRI is needed for preoperative planning. Evidence suggests that dual-isotope imaging with technetium Tc 99m and thallium Tl 201 single-photon emission CT (SPECT) is accurate in distinguishing various tumors of the salivary glands, including pleomorphic adenomas. Arbab AS, Koizumi K, Toyama K, et al. Various imaging modalities for the detection of salivary gland lesions: the advantages of 201Tl SPET. Nucl Med Commun. 2000 Mar. 21(3):277-84. [Medline]. Howlett DC, Kesse KW, Hughes DV, Sallomi DF. The role of imaging in the evaluation of parotid disease. Clin Radiol. 2002 Aug. 57(8):692-701. [Medline]. Woo SH, Choi DS, Kim JP, Park JJ, Joo YH, Chung PS, et al. Two-phase computed tomography study of warthin tumor of parotid gland: differentiation from other parotid gland tumors and its pathologic explanation. J Comput Assist Tomogr. 2013 Jul-Aug. 37(4):518-24. [Medline]. Strub GM, Georgolios A, Graham RS, Powers CN, Coelho DH. Massive transcranial parotid pleomorphic adenoma: recurrence after 30 years. J Neurol Surg Rep. 2012 Oct. 73(1):1-5. [Medline]. [Full Text]. Sharma N. Pleomorphic adenoma of the buccal salivary gland: magnetic resonance imaging findings with differential diagnoses. J Investig Clin Dent. 2012 Aug. 3(3):228-31. [Medline]. Klotz LV, Ingrisch M, Eichhorn ME, Niemoeller O, Siedek V, Gürkov R, et al. Monitoring parotid gland tumors with a new perfusion software for contrast-enhanced ultrasound. Clin Hemorheol Microcirc. 2014. 58 (1):261-9. [Medline]. Zaghi S, Hendizadeh L, Hung T, Farahvar S, Abemayor E, Sepahdari AR. MRI criteria for the diagnosis of pleomorphic adenoma: a validation study. Am J Otolaryngol. 2014 Nov-Dec. 35 (6):713-8. [Medline]. Iguchi H, Yamada K, Yamane H, Hashimoto S. Epithelioid myoepithelioma of the accessory parotid gland: pathological and magnetic resonance imaging findings. Case Rep Oncol. 2014 May. 7 (2):310-5. [Medline]. Brunese L, Ciccarelli R, Fucili S, Romeo A, Napolitano G, D'Auria V, et al. Pleomorphic adenoma of parotid gland: delayed enhancement on computed tomography. Dentomaxillofac Radiol. 2008 Dec. 37(8):464-9. [Medline]. Habermann CR, Arndt C, Graessner J, Diestel L, Petersen KU, Reitmeier F, et al. Diffusion-weighted echo-planar MR imaging of primary parotid gland tumors: is a prediction of different histologic subtypes possible?. AJNR Am J Neuroradiol. 2009 Mar. 30(3):591-6. [Medline]. Tsushima Y, Matsumoto M, Endo K, et al. Characteristic bright signal of parotid pleomorphic adenomas on T2- weighted MR images with pathological correlation. Clin Radiol. 1994 Jul. 49(7):485-9. [Medline]. Kakimoto N, Gamoh S, Tamaki J, Kishino M, Murakami S, Furukawa S. CT and MR images of pleomorphic adenoma in major and minor salivary glands. Eur J Radiol. 2009 Mar. 69(3):464-72. [Medline]. Bradley MJ, Durham LH, Lancer JM. The role of colour flow Doppler in the investigation of the salivary gland tumour. Clin Radiol. 2000 Oct. 55(10):759-62. [Medline].